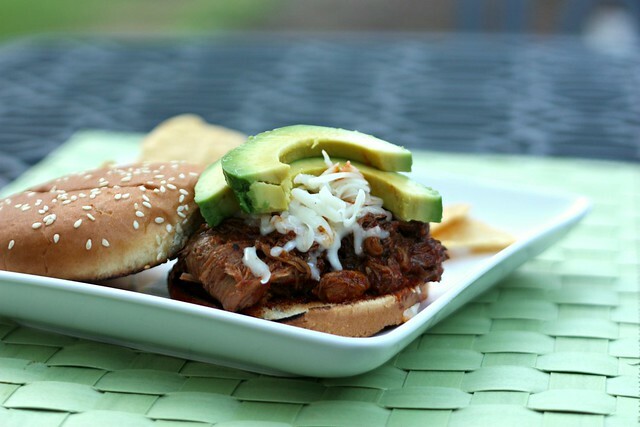 Slow Cooker Carne Adovada Cemitas – Elly Says Opa! Meal planning has been really difficult for me lately. It’s just been…annoying. I get into these funks from time to time and they can be really hard to snap out of. I’m the one who plans all the meals and makes the grocery list, and you’d think it should be easy because I (typically) enjoy cooking and my family is not picky, but it isn’t. It can take me ages to decide on a meal, and then I end up at the grocery store three times that week because I’ve managed to mess up the list or realize I’m out of a “staple” too late. I actually cleaned and organized my pantry recently and made a spreadsheet of everything in it (DORK ALERT) to help out (and also so that when I’m sitting on the couch making these lists I don’t need to, you know, get up and check our stock). A couple weeks ago, I took a few cookbooks and went into the kids’ playroom and asked Zachary if he wanted to help. The first book he chose to flip through was The New Southwest. When he came to these sandwiches, he said, “I want to have these next week.” A quick scan of the ingredient list confirmed we would love these, and then seeing they were made in a slow cooker sealed the deal. One meal down! These sandwiches are made with shredded pork that has a double-spice effect: a little heat (from the New Mexico chiles, which are not overtly spicy) and Mexican canela or cinnamon. They’re topped with cheese (any kind you want to use will work, really) and creamy avocado. Served on a bun, they’re a welcome change from your standard pulled pork recipe, and one our entire family enjoyed. I actually made a similarly-spiced pork dish a few months back that was cooked with hominy instead of made into a sandwich, and although we liked it, I really think this version blew it out of the water. So even if I decide to go the non-sandwich route next time, I plan on using this recipe for the meat. I will say that although the prep for the slow-cooking part of this is basically non-existent there is some work to be done after. You need to make a sauce, and then simmer the shredded pork in the sauce for about 20 minutes. I decided to make the sauce the day before and just refrigerated it right in the medium stockpot I used to make it, where the shredded pork went the following day. As it simmered to thicken, I of course did very important things like changing out of my work clothes, because if I cannot be in yoga pants at home, then what’s the point of even being at home? 1 pork shoulder or pork roast, about 3 lbs. Stir together the oregano, thyme, canela, 2 chile pods (2 chiles, not 2 oz. ), and broth in the bowl of a slow cooker. Add the pork (you may want to add additional broth or water depending on your slow cooker). Cook for 4-5 hours on high or 8-11 hours on low. Remove the pork and shred with two forks. Skim the fat off the top of the cooking liquid, and then reserve 2 cups of the liquid. Remove the stems and as many seeds as possible from the remaining chiles. Place them in a heavy-bottomed stockpot over medium heat, stirring to allow even toasting, for approximately 3-4 minutes. Add enough water to cover the pods. Bring to a boil and then cook for 15-20 minutes until chiles are tender and pliable. Remove chiles and discard water. Heat the oil in the now-empty stockpot and saute the onion until tender. Add the garlic, cooking about a minute, until fragrant. Place in the bowl of a food processor (or leave in the pot if using an immersion blender). Add the vinegar, honey, cumin, salt and pepper, and the boiled chiles. Process until smooth. Place the sauce, shredded pork, and 2 cups of reserved cooking liquid in the stockpot. Bring to a boil and then reduce the heat. Simmer for about 20 minutes, stirring occasionally, to thicken and reduce the sauce. Season to taste. Heat butter in a skillet, and then toast the insides of the buns. Serve the pork on the toasted buns, topped with cheese, sliced avocado, onion, and cilantro. *Note: As I was making this, I realized I only had about 1-2 Tbsp. of honey left (see my earlier comment about forgetting food on the grocery list…) and ended up using a couple tablespoons of brown sugar in its place.